Georg Buchner wrote a little play called Woyzeck. Well, he started to and then he died. In 1837, Woyzeck was presumably mostly finished leaving those artists who were fascinated by the piece the option to “finish” the puzzle for him, meaning rearranging the order if they so choose. In Woyzeck: The Human Experiment, writer-director John Bezark has adapted Buchner’s classic in intriguing way. This version of the drama is a live-action choose your own adventure where the audience is given the chance to vote on Woyzeck’s journey to insanity. Taking the fragmented drama allows for endless possibilities, but deep inside, Woyzeck’s journey is clear. A lowly solider, Woyzeck lives with Marie, the mother of his child born out of wedlock, earns money by shaving the Captain and being a human experiment for the Doctor. As time progresses, Woyzeck begins to lose his mind when the experiments grow stranger and his love falls for another. With the climax pretty much in place, the journey to the tipping point is up for interpretation. And that’s where Bezark’s piece comes into play. 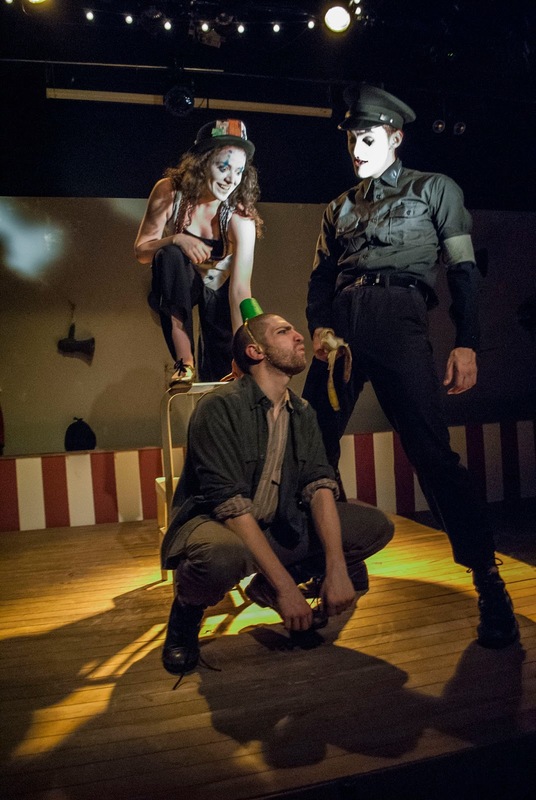 Bezark and his actors allow the audience to choose the journey Woyzeck goes on. By simply voting with your smart phone, you get to choose who Woyzeck talks to next, where his next adventure is, and what he gets to do at his destination. Where Bezark and his team succeed is the concept. A live action event of this nature is hard. Precision is key. While the technical aspects of the voting where clearly not perfected, forcing some of the actors to improv beyond their ability, the problems of this piece were strongest in the grasp of the source material. Adapting allows the writer the freedom to pick and chose what they feel furthers their piece. By abandoning Buchner’s words through any translation for a modern tongue hurt the piece tremendously. While it simply could be due to the nature of the unknown, the moments of improvisation wanted so desperately to be scripted. To ensure that a smooth story is told, rehearsing every possible scenario allows for the dead space to be avoided. Beyond that, picking a concrete acting style for the company is quite necessary. The sextet brought a mixed bag of choices. The strongest, and most compatible for the piece, was the slightly heightened essence of Kyle Walton as the Doctor. Walton transformed into the role easily, bringing a tinge of vocal inflection that created a strong character. Amber Avant as Marie had moments of great choices, especially in the more dramatic scenes, but she lost her character in the moments of improv. Brandon Zelman as Woyzeck brought a modern comedic tone to the character. He found humanity, something that is rarely explored. Perhaps due to the space caused by the piece though, his trip to madness was unclear. For those unfamiliar with the arc of the character, it’s possible it was completely confusing. Aishling Pembroke stood out by introducing an accent to the Carnival Barker, something the others did not. This lack of cohesion pulled away from the ensemble work. When it came to filling the gaps, Pembroke and Zelman may have been the strongest when it came to thinking on their feet. Bezark and his creative team used a carnival theme through an expressionistic lens to tell the story. It was an obvious choice that was perfect. The set by Daniel Geggatt was simply surreal. With the iconic red and white tent-like barrier, it was clear where we were. The wall of props that the company pulled off was a brilliant touch that added to the concept. Alex De Nevers lighting was strong, using a spotlight to give the expressionism feel in certain scenes. While the technological aspect was dragging, the voting pods after the selection were beautiful images. The costumes by Siena Zoe Allen, like the acting styles, was all over the place. There were basics of period mixed with modern elements but cohesion was lacking. What Woyzeck: The Human Condition was time. A lot of time. There is great potential in a future for this piece. But clarity and a strong cohesive vision will allow it to be something special. In the next iteration, a smoother voting process will be essential. Perhaps incorporating a projector with the live-voting could be of great aid.